Find comfy, trendy maternity jeans. Try them on and walk around before deciding on a pair, or order several fits when shopping online so you can choose your favorite and return the rest. Look for tanks and shirts that offer style as well as room for your expanding belly. Find prints that can work for career or casual settings by dressing them up or down to suit the occasion. Choose a cute maternity dress for special occasions, such as weddings and dressy parties. 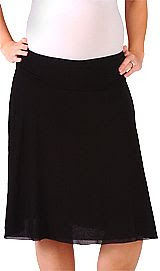 Look for a style that will complement the different stages of your pregnancy, such as above-waist ribbon detail. Beside that, woman in pregnancy also should consider about the material or fabrics kinds in choose the maternity dress, because pregnancy woman tends to be sweaty :). It is strongly urged all expecting mothers to find maternity clothing that fits them properly. Just as in your non-pregnancy life, clothing that is too tight or too loose can make you look and feel larger. Another quick fix for when you are feeling down about your new size? Try “dipping,” which is dressing from top to bottom in one color such as black or dark brown.